If you follow me on Pinterest, you know I love a good outdoor living space. 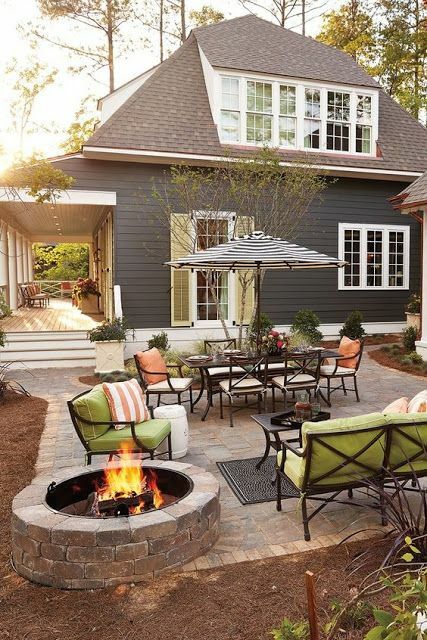 If you’re looking for some ideas for your back yard patio outdoor living area, check out these five incredibly different and totally inspiring layouts. 1. Everything at your fingertips. Covered porch, dining area, comfortable lounge chairs, and a great big fire pit? Yes, please! This back yard patio space has everything you need to complete your outdoor living experience. 2. All the lights. I’m a huge fan of stringed lights, and seeing how lovely the layout of this back yard patio area looks in the light, I can only imagine how cozy it would look at night! If your outdoor living space lacks overhead cover, stringed lights are an ideal option. 3. Best use of small space. 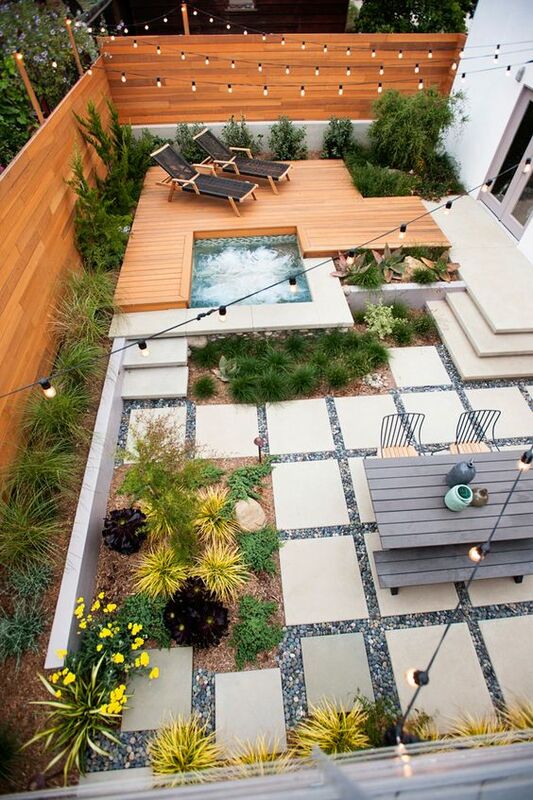 If your back yard patio living area lacks square footage, don’t worry! 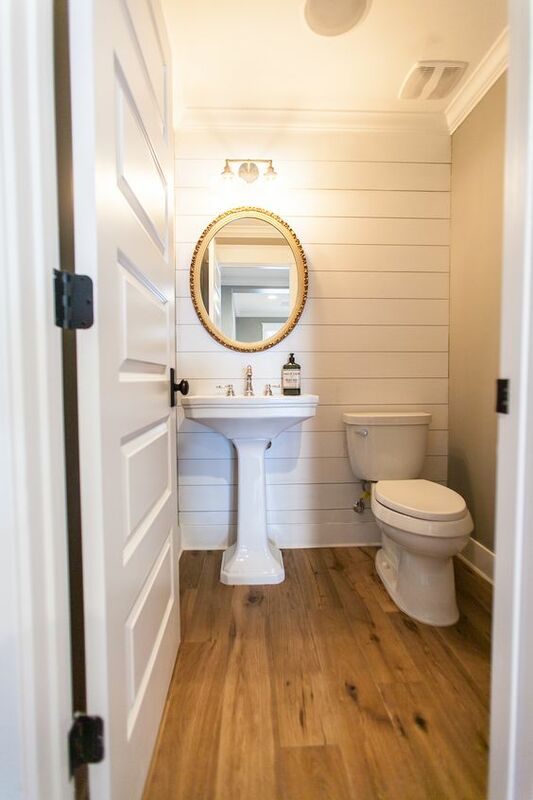 Take note of how this small space makes the most of every inch. 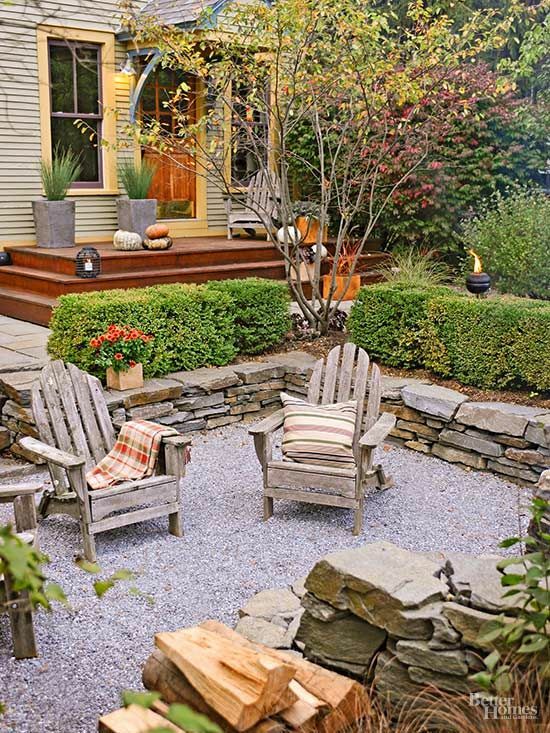 From lounge chairs and a mini hot tub to low maintenance plants and an outdoor dining area, this is an attractive space. 4. Best use of colour. Love that outdoor tile! Reminiscent of the French countryside, this back yard patio makes great use of colour by matching the tile colour with the patio door and window surrounds. 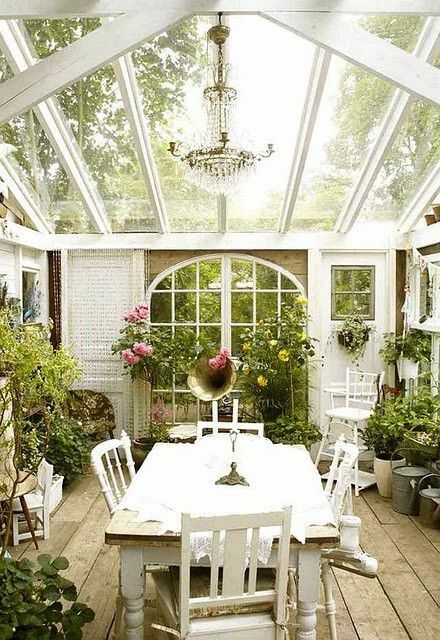 Add to that some greenery and feminine flowers, and this is a lovely space for entertaining. 5. Stone surround. Who says your back yard patio has to actually be on your patio? The patio picture here transitions easily into an outdoor living space with a stacked stone surround. Add some boxwoods (or greenery of your choice), and this is a nice space for early morning coffee and conversation. Whatever your personal preference, creating a back yard patio space that you love doesn’t have to be difficult or overly expensive. Work with what you have, and play up the features of your home. 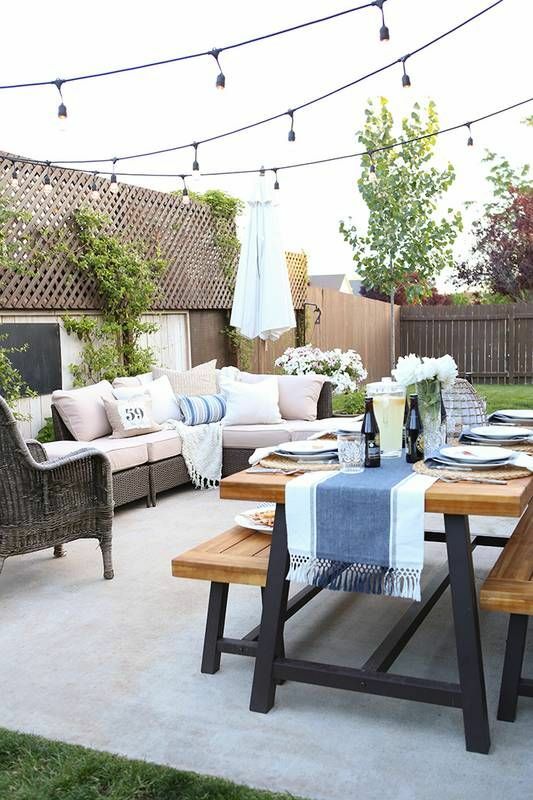 Check out my Outdoor Living board on Pinterest for more patio inspiration! 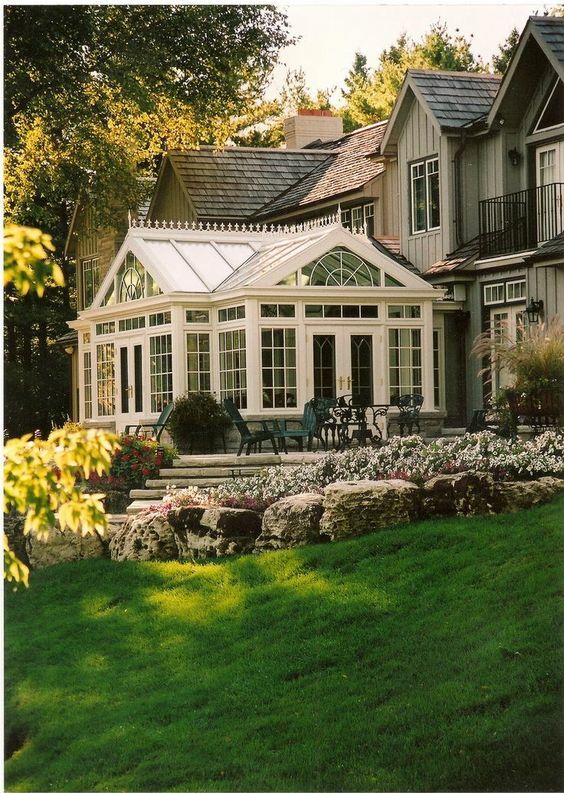 Whether it’s my obsession with the board game Clue, or my childhood memories of sitting in my Grama’s “sunroom”, I’ve long had a fascination with conservatories (often known Stateside as “greenhouses”). Wes and I have often discussed our mutual love of conservatories, and how fascinating (and awesome!) it would be to have tropical-like plants blooming year-round in our home. Imagine, lemons and limes at your convenience, grown in your own home? If you’re not familiar with the idea of a conservatory (or a greenhouse), a conservatory is a building or space that has a glass roof and walls that is used primarily as a greenhouse or sunroom space. 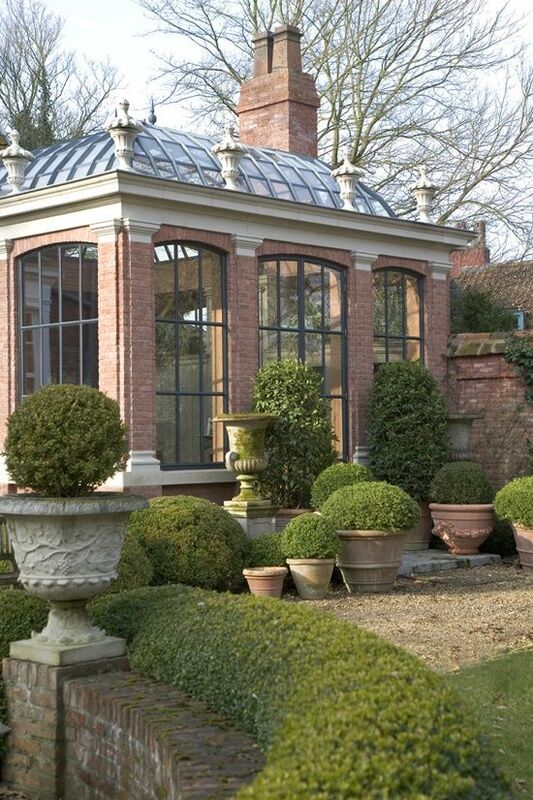 Conservatories originated in the 16th century, when wealthy landowners wanted to grow their own citrus fruits. If you’ve been following along on Pinterest, you know I’ve been pinning some beautiful conservatory spaces. Today I’m sharing 9 beautiful conservatories to get you inspired. 1. Classic and conservative. My first thought when I saw this attached conservatory was how much I like the idea of a conservatory with functional windows. Quite often if you’re looking at a conservatory or greenhouse as an extension of the home, functional windows aren’t an option. I feel like having windows that open would make a conservatory feel more like a sunroom. Love! 2. Shabby chic. First of all, any room with a gorgeous chandelier is a ‘yes’ in my opinion. The fact that this chandelier is centred under a glass ceiling with white walls, beautiful blooms, and an area for entertaining makes this conservatory space all the more appealing. 3. Bricks ‘n mortar conservatory. Looking more like an extension of a royal palace, this conservatory is quite literally made from bricks and mortar. With a chimney accent and no detail spared, I can only imagine the how beautiful the rest of this residence is. There’s something about greenery surrounding a traditional build that appeals to me. 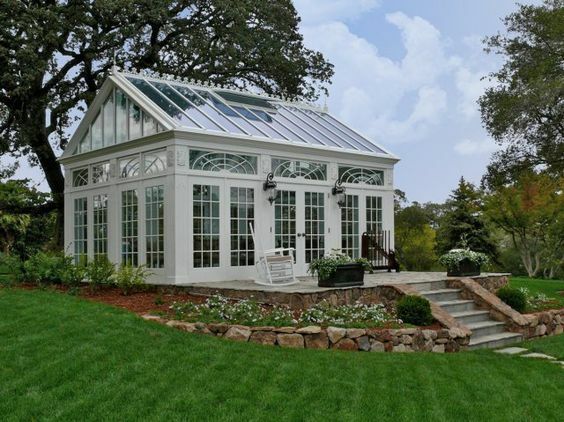 This conservatory is large, which suits the strong materials with which its built. 4. Extended living area. Even if you don’t use your conservatory for growing greenery, a conservatory can still be a very practical part of a home. 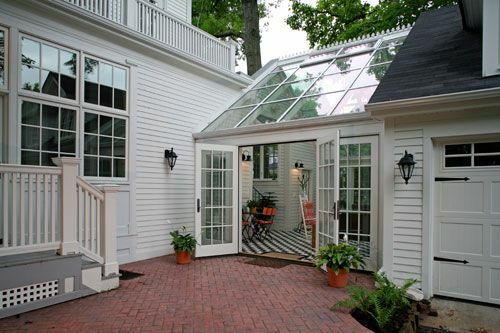 Think of it as an extended living area, a covered porch, or a screened-in sunroom. I love how this connected home even has a fireplace as part of one of the conservatory spaces. 5. Exquisite addition. Definitely more traditional in taste (and by the photo obviously being used for the traditional purpose a conservatory was meant for), this space features many intricate details. 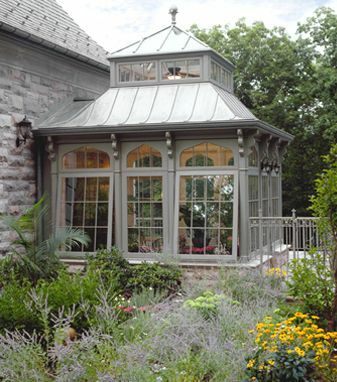 From the beveled glass to glass cupola, this greenhouse is certainly a conversation-starter. 6. Screened-in living. What I love about this conservatory is that it opens up to reveal a beautiful outdoor living area, which really makes the conservatory more of an extension of the home. The fact that its finished in a classic cream colour with matching muntin bars in all the windows (including the eyebrows) really adds to the appeal and interest of this space. 7. Sweet escape. 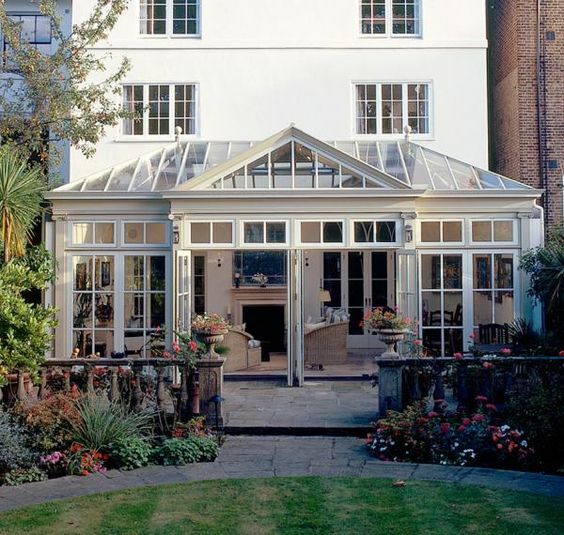 Not all conservatories have to be attached to the home. This double greenhouse area is separated by a small concrete patio some picturesque green surroundings. I love the accent lighting inside the conservatory for twilight viewing. I can imagine this would be an ideal space for star gazing as well! 8. Mudroom conservatory. A transition space between a garage and a home, this conservatory acts more like a mudroom than a practical plant-growing space, and I like it! The french doors and all-glass ceiling provide lots of natural light to what could otherwise be a dark and uninteresting space. 9. 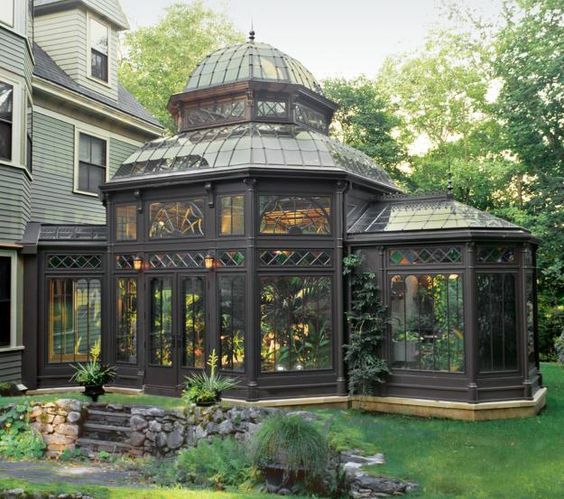 The ideal conservatory. 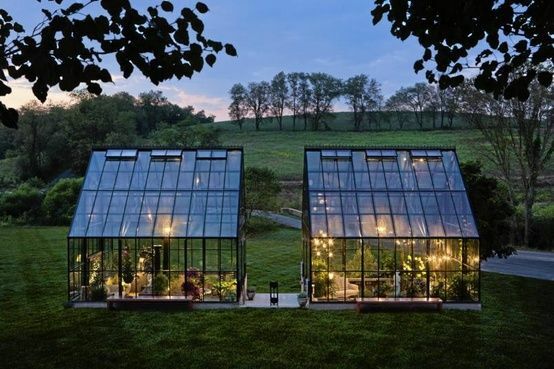 Again, there’s something about a greenhouse or conservatory space that’s not attached to the home that fuels a curiosity to see what’s inside. This space is designed almost like a garden cottage on the property. I love the all-white, and the simple garden patio area. If you’re looking for conservatory inspiration or greenhouse design ideas, check out my Pinterest For the Home board. 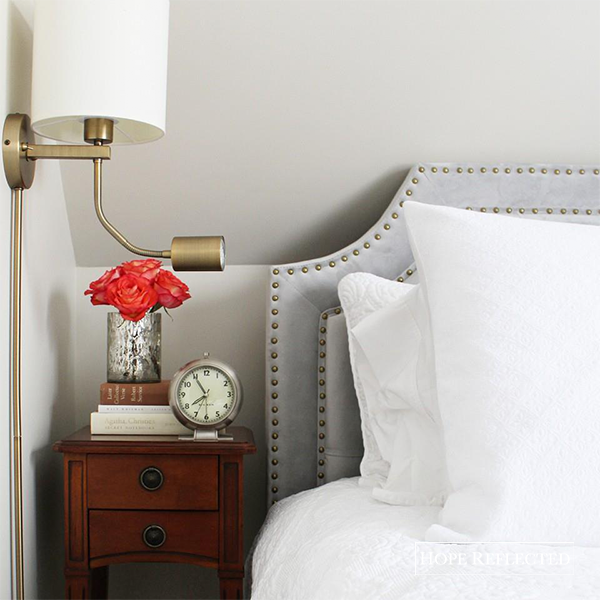 I’m always pinning lots of dreamy ideas and inspired vignettes! After a long day at work, there’s little that compares to comfort of a big cuppa tea, my favourite chair, and a good book or conversation. Wes and I love good books and conversation, and one of our favourite past times is taking time to just sit and talk or read a good book in one of the sitting areas in our home. If you’re looking to create a sitting area, or re-evaluating an existing room in your home, I’d highly encourage you to consider investing in two high-quality chairs. Create yourself a niche that will work to decompress and inspire; an area that will help you unwind and regroup. 1. The right chair. Sitting areas are called sitting areas for a reason: They’re meant to have chairs, and they’re meant to be sat in and enjoyed. In order to accomplish this, you need the right pair of chairs! 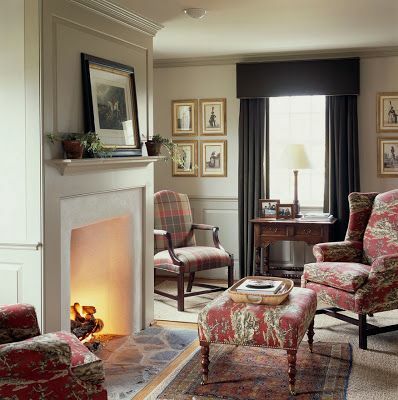 Wes and I are fans of the classic wingback, but depending where in your home you’re looking to create a sitting area, you may consider a club chair, a slipper chair, or even a chaise lounge. 2. Natural Lighting. 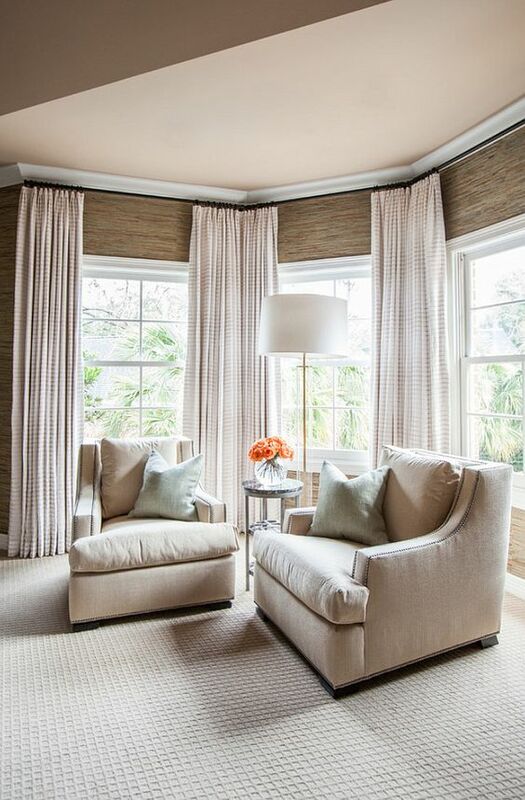 When you’re creating a comfortable sitting area in your home, natural light is essential. There’s something so soothing about sitting down in a chair and being able to enjoy and soak up natural light. 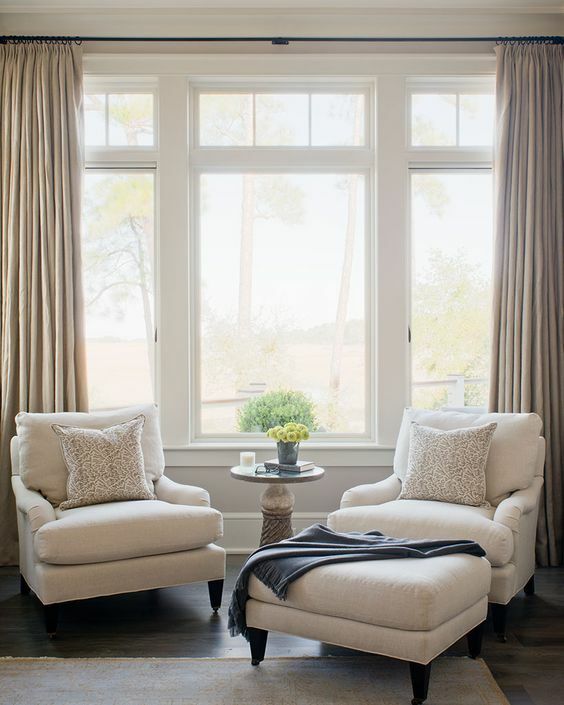 Some of the best sitting areas are strategically designed beside large windows that draw the light inside. 3. A good lamp. Sitting areas are meant to enjoyed at all times of day, and no matter how large your windows and no matter how much natural light gets in, you’ll want to invest in a high quality light piece — whether a floor lamp or table lamp — to provide some direct, warm light. Trust me, especially if you’re a reader, a good lamp is an essential component to any sitting area. 4. Supportive cushions. If you’re planning to watch a good hour of TV, or you’re chapters-deep into a good book, a supportive chair cushion can work wonders to provide comfort (and lower back support!) in a sitting area. The great thing about cushions is that they’re affordable, and you can change up the entire theme of a sitting area by switching out the cushions! 5. A side table. 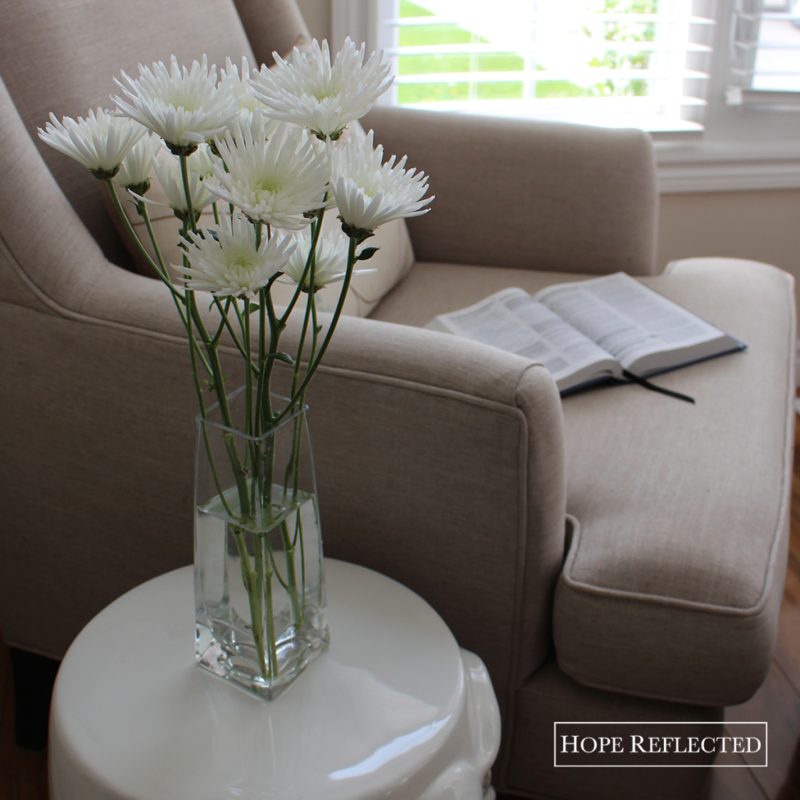 For your book, for your drink, or even for a box of tissues, sitting areas aren’t complete without a solid side table. Pro tip: Choose a ‘table’ that can act as extra seating should you have guests over. 6. The right ottoman. No sitting area is complete without the right ottoman on which to rest your feet. If you can invest in a piece that matches the chairs in your sitting room, I’d highly encourage it; the extra cost is worth it in the long run, and your feet will thank you. Sitting areas don’t have to be hard to create! As long as your sitting area contains the six essentials above, you’re set! If you’re looking for more sitting area inspiration for the home, be sure to follow my For the Home board on Pinterest for more ideas. A couple of weeks ago, I posted about ways to lighten up your home during the winter season. Winter can be a difficult time of year, especially if you suffer from Seasonal Affective Disorder or if you’re housebound. That being said, winter can also provide a great opportunity to make some changes to the interior of your home. While I’m a big fan of white and neutrals, I also love the occasional pop of colour and pattern. 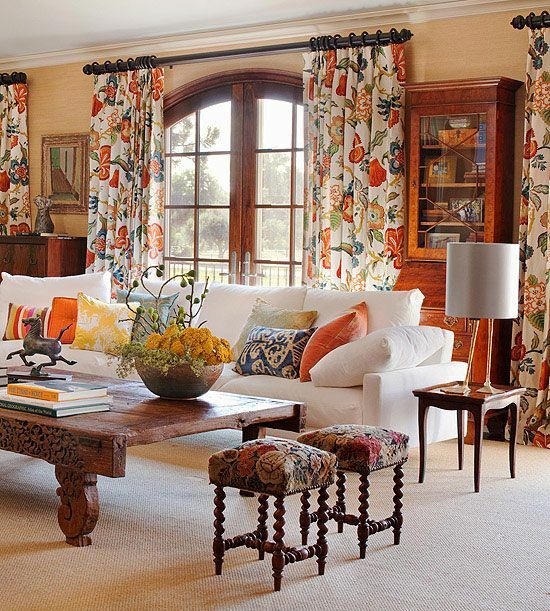 Pattern done right in a room can make a space. If you’re looking for home design inspiration and interior design ideas, be sure to follow me on Pinterest. 1. Fun floor tiles. Adding pattern doesn’t have to be anything extreme, and especially in the kitchen where pattern might be more predictable or expected as part of a blacksplash, why not spice things up with some fun floor tiles? 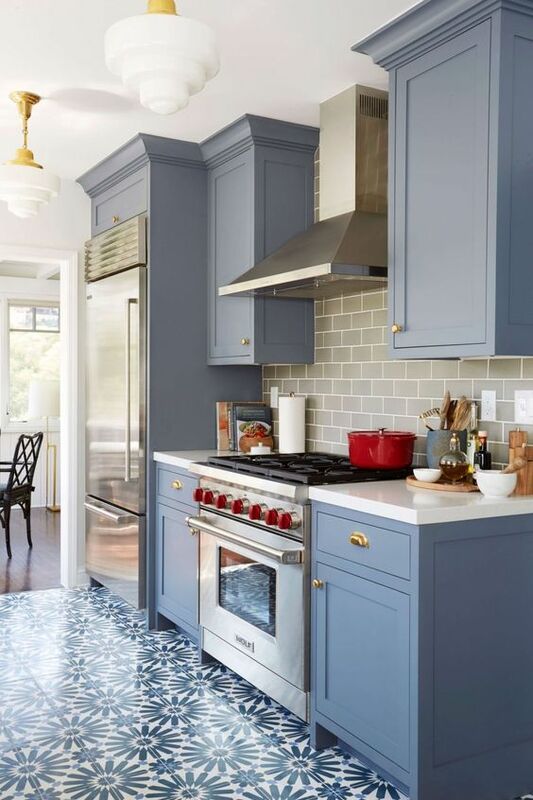 Rather than working with many different colours, a good rule of thumb is to choose a floor tile where the dominant colour complements your kitchen cupboards (or countertops). 2. Work in some wood. Bold, unexpected, and certainly a conversation piece, if you’re looking to add pattern to your home, do it with a natural element, like wood. 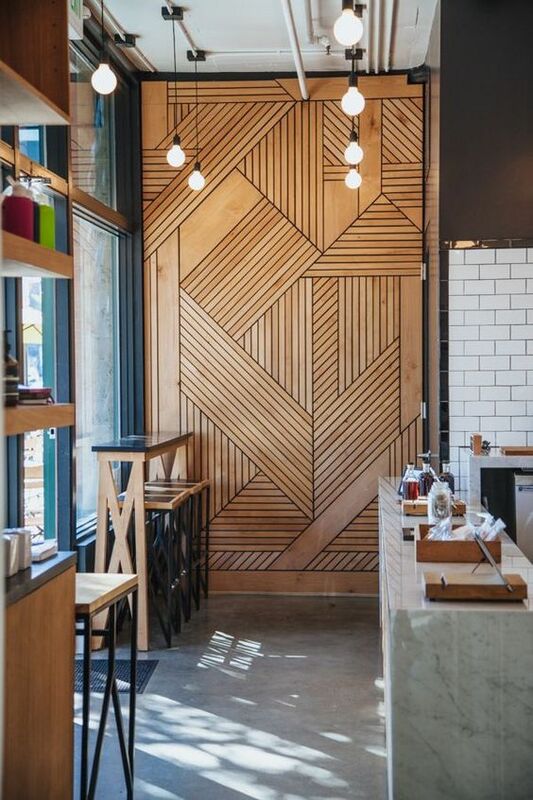 A naturally stained, patterned wooden wall could add warmth to an industrial space or neutral room. 3. Colour by curtain. 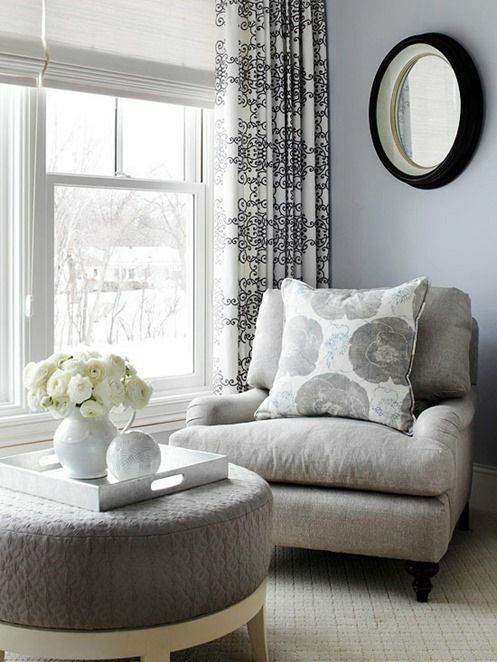 If you’re hesitant about adding pattern to your home, an easy and inexpensive way to experiment with pattern is by adding pattern to your home using curtains in a bold colour and pattern. This works well in a room where the furniture is otherwise neutral in colour. Accessorize with complementary-coloured cushions and accent pieces. 4. Patterned ceiling. 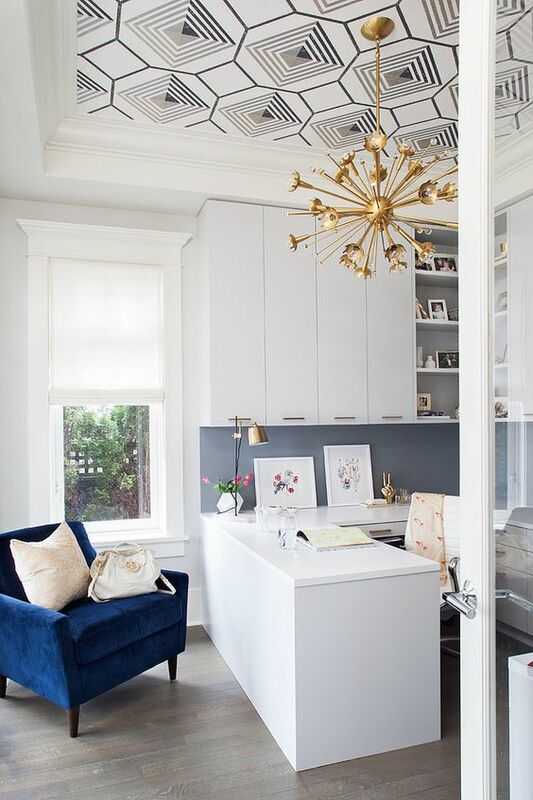 What I love about adding an accent ceiling, is that you can keep your space otherwise neutral, and then you look up and, “Wow!” A patterned ceiling is a bold, refreshing way to incorporate pattern into your home. 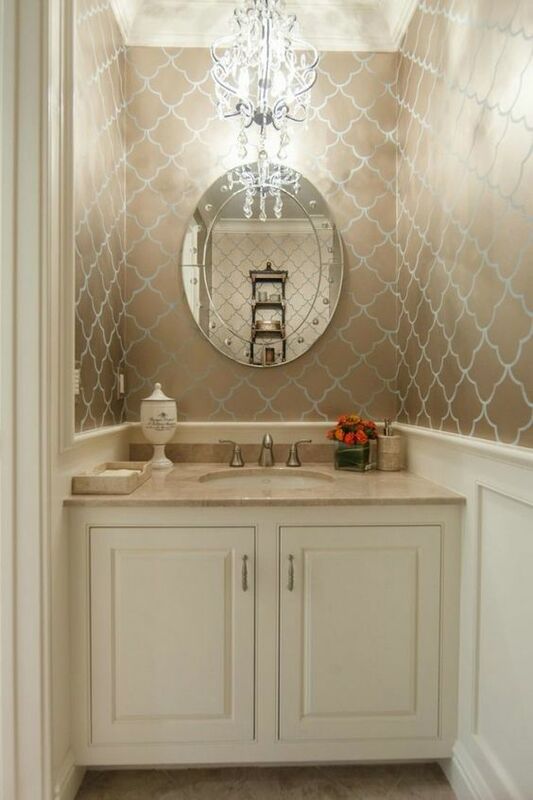 Depending on the pattern, you may want to look at a patterned ceiling in a powder room, guest bedroom, or home office. 5. Patterned furniture. Having a favourite wingback chair and ottoman reupholstered in a bold printed fabric is a great way to add pattern to your home. 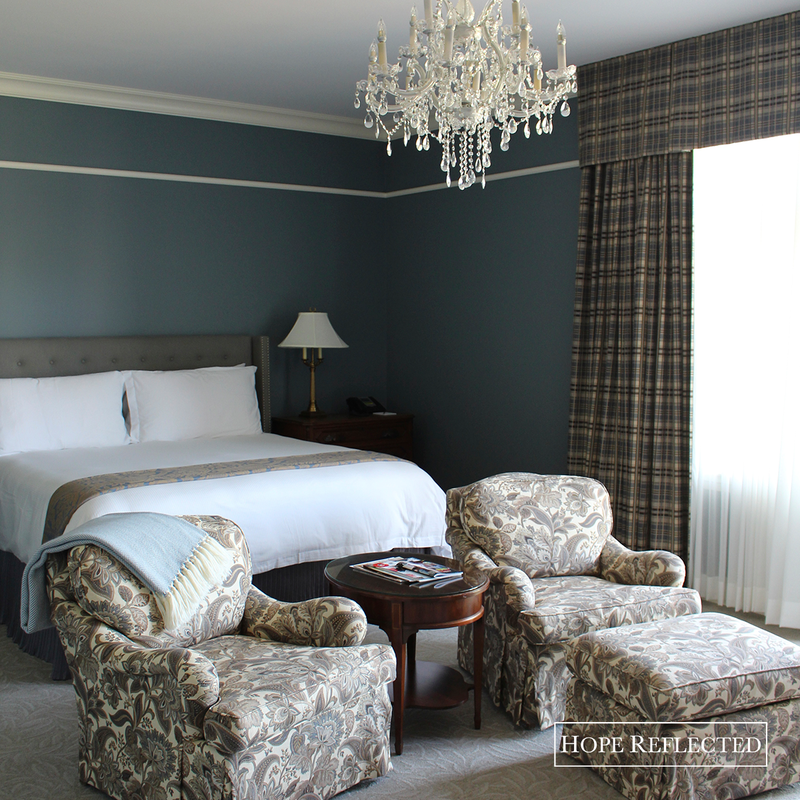 Especially effective in rooms with a neutral colour palate, patterned furniture is both bold and warm. If you’ve got more than one favourite chair, consider having both chairs reupholstered in patterns that complement each other. 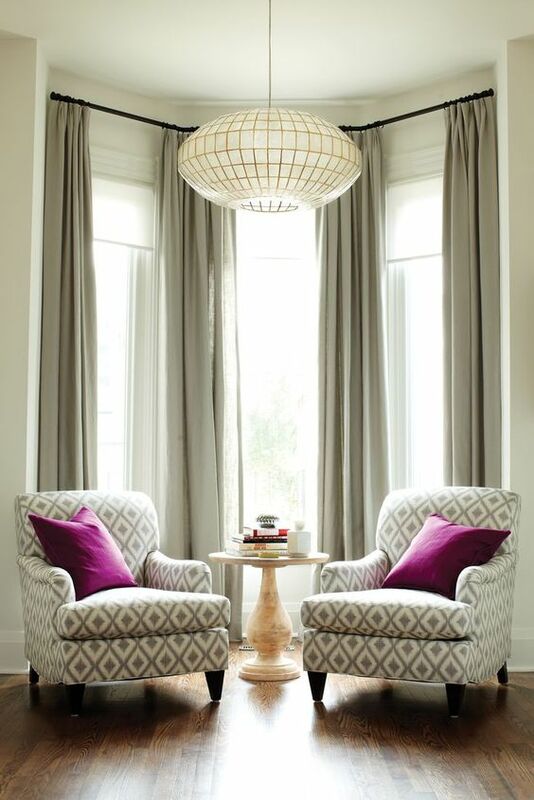 As demonstrated in the photo below, coordinating (but not matching) patterns can really warm up a space. 6. Wallpaper. Don’t panic. 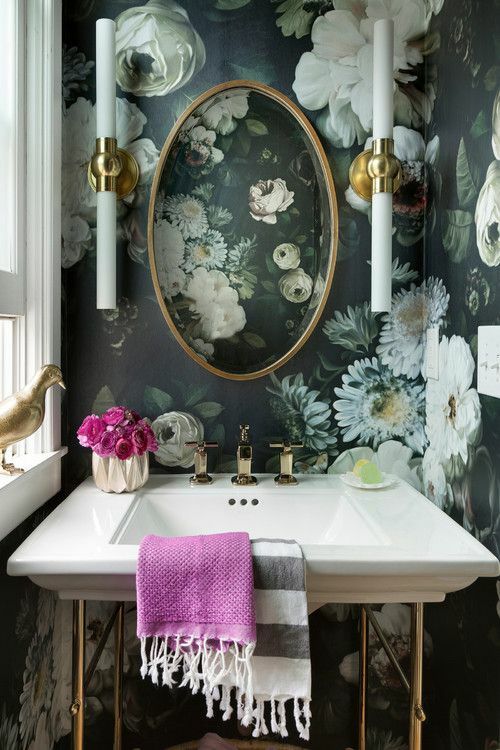 If you’re having visions of wallpaper gone wrong, open your eyes and check out some of the fantastic options that are out there. 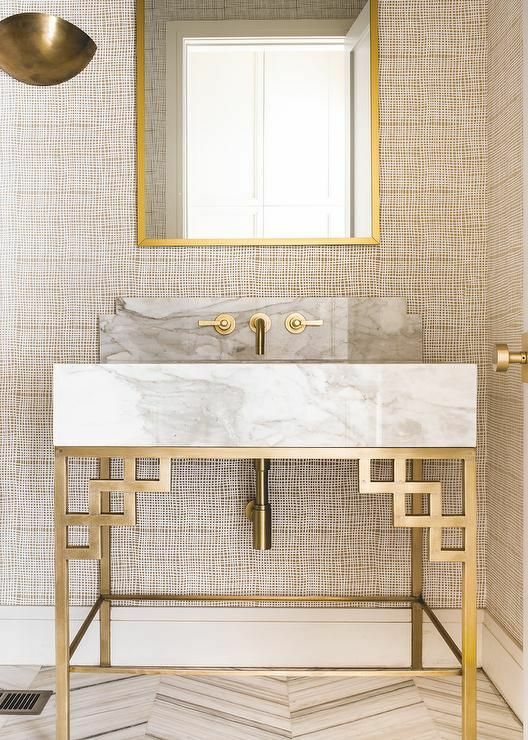 Even if you’re not willing to entertain it for an entire room, consider experimenting with an accent wall (or small space, such as a powder room). 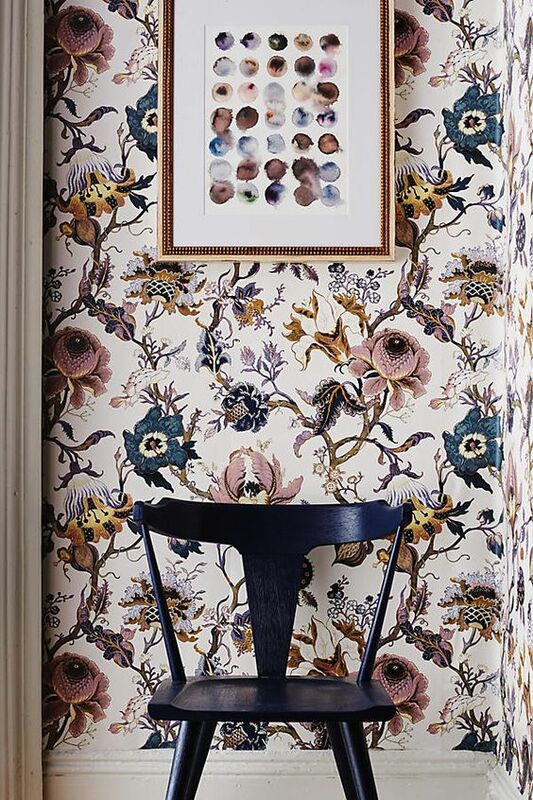 A little wallpaper can go a long way (and look wonderful). If you’re looking for more pattern inspiration and tips on how to incorporate pattern in your home, be sure to check out my For the Home board on Pinterest. I’m always pinning home decor ideas and would love to hear from you! If you follow me on Pinterest, you know I’m a huge fan of white. I love white. White kitchens, white bathrooms, white furniture; you name it, I love all things neutral. Creating a home filled with neutrals can be difficult, — especially if you have animals or small children, — so today I’m sharing 5 ways to lighten up your home this year. 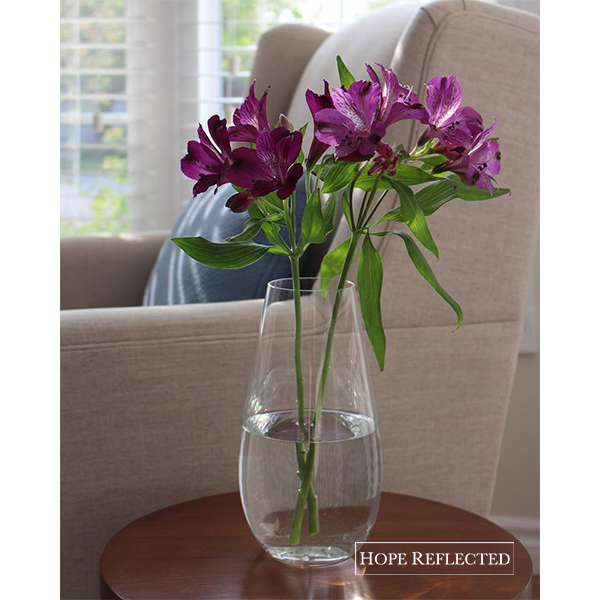 There are many ways to lighten up and brighten up your home! 1. Brighten up with some flowers. I love flowers, and as tradition would have it, Wes brings me home a beautiful, fresh bouquet each Friday. 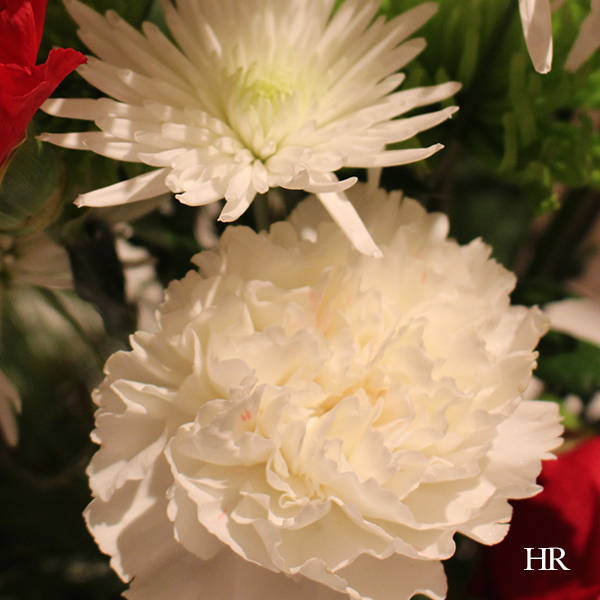 Even if you don’t have a whole bouquet of flowers, a single flower can add a pop of colour and brighten up your space. 2. Let the light in. Lightening up your home can be as simple as opening the blinds and letting some natural light in. Fan of heavy drapery? During the daylight hours, opening blinds or drapes can go a long way in letting light in and brightening up your space. Looking to hang drapery in your home this year? Here’s a tip: To make the room seem taller and more spacious, hang the curtain rods well above the window frame, right below ceiling level. You’ll add a whole lot of height to the room! This also helps let more light in when the drapes are open. 3. Clean off your kitchen counters. I don’t care what colour palate your kitchen is, cleaning off your kitchen counters is a great way to lighten up your home. Not only does de-cluttering make you feel good (great! ), de-cluttering and cleaning off your countertops gives the illusion of more space and a clean space. 4. 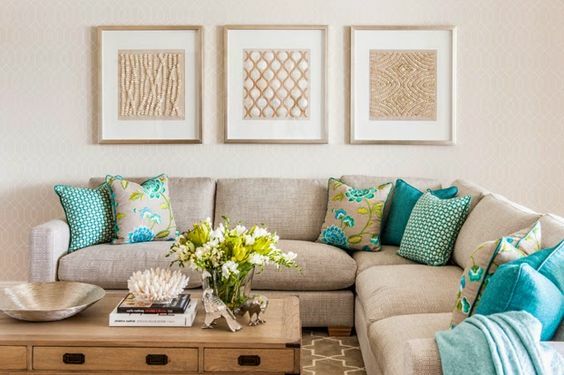 Incorporate some coloured cushions into your living space. You don’t have to spend a lot to lighten up your home; purchasing some coloured cushions (or cushion covers) to add to your living space is an easy way to brighten and lighten up your home! New to colour? A good rule of thumb is to start with a single hue. If you’re someone who’s comfortable with colour, select some pieces with contrast for a real burst of colour. 5. Refresh your bedroom with new sheets. While Wes and I are big fans of white, pick your favourite colour and get some new sheets! New sheets can make a huge difference in lightening up your home. Since you sleep on them every night, I’d suggest investing in sheets that are high quality cotton (check out Gluckstein Home; Brian’s namesake brand makes theee most amazing sheets of life). It doesn’t have to be difficult to lighten up your home; whatever your colour scheme, whatever your style preference, following the suggestions above can kick start your year and brighten and lighten up your space! Be sure to follow me on Pinterest for more home and interior design inspiration! Not to generalize, but I think that most women have an appreciation for a classic white kitchen cabinet, am I right? If you follow me on Pinterest, you know that I love white cabinets. That being said, I also think there’s something inspiring about stepping outside the box and getting adventurous with colour. A bold splash of colour, even if it’s on an island, upper cabinets, or lower cabinets, can take a room to an entirely different level. Today, I’m sharing 5 Benjamin Moore kitchen cabinet colours that are not white. 1. Benjamin Moore Indian River. 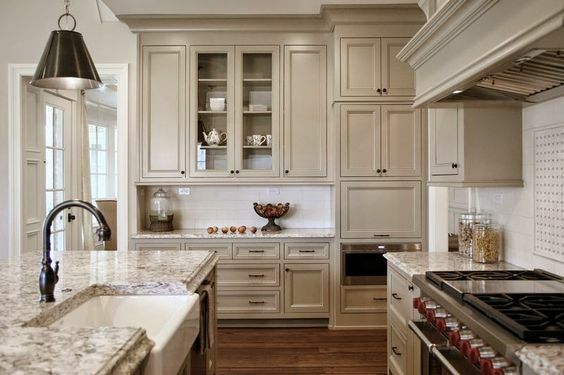 Still classic, but definitely not white, this taupe-y, warm colour works beautifully, especially on these cabinets that climb right to the ceiling. I love how the home owner kept the black splash white, did the cabinets in Benjamin Moore’s Indian River, and married the two in the granite countertops. 2. Benjamin Moore Philipsburg Blue. 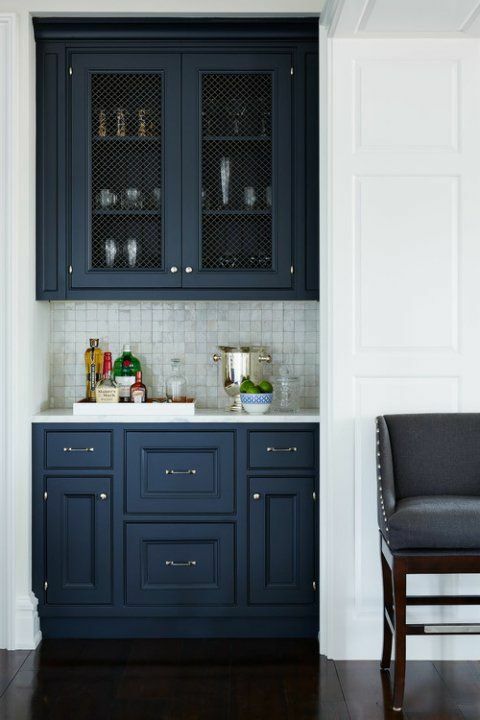 OK, can we just talk about this butler’s pantry for a second?! LOVE! It’s like an updated version of something straight out of an episode of Downton Abbey. 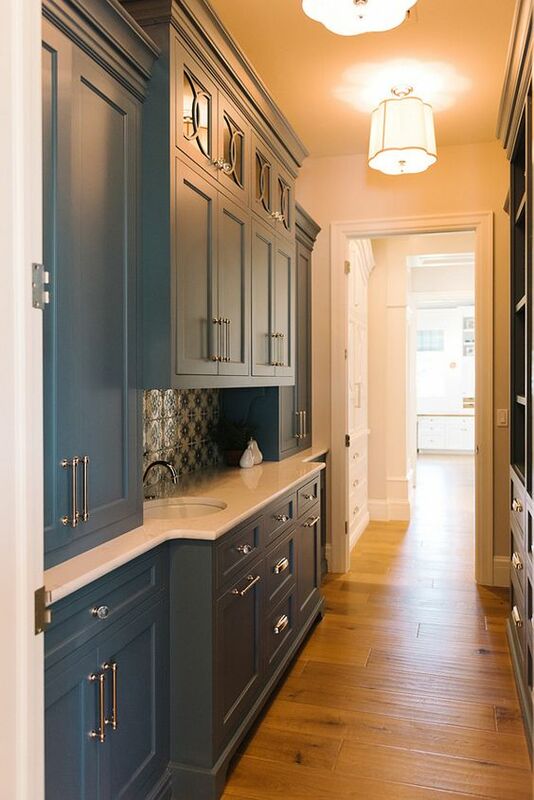 Besides the pantry design itself, I love the cabinets done in Benjamin Moore’s Philipsburg Blue. 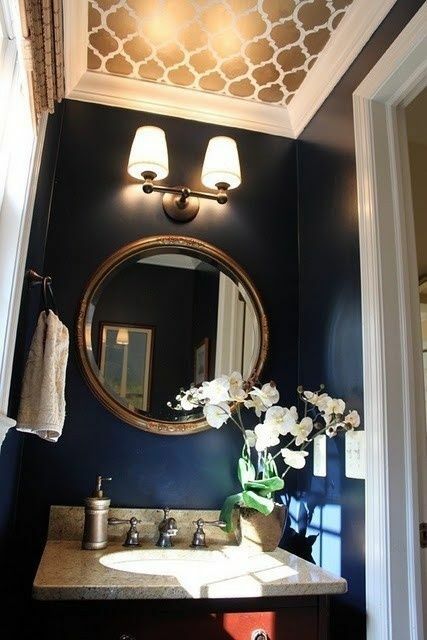 Bold, rich, and strikingly traditional, the deep teal blue works well in this long, narrow space. Also, that backsplash. Yes. 3. Benjamin Moore Raccoon Fur. At first glance, you may not notice much difference between the kitchen cabinet paint colour and above and the one featured here. Benjamin Moore Raccoon Fur is more blue than the Philipsburg Blue cabinets shown above. More cool, I like how the homeowners paired the cabinet paint with a cold white on their walls and ceiling leading into the wet bar area. 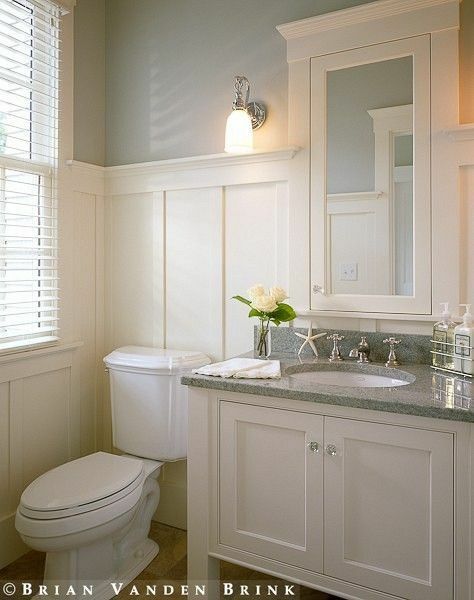 Very masculine and strong, a little splash of Benjamin Moore’s Raccoon Fur speaks volumes (and looks fantastic). 4. Benjamin Moore Smoke Embers. You might say these cabinets look very close to white, but look again. The lower kitchen cabinets are a subtle, soothing shade called Smoke Embers by Benjamin Moore. 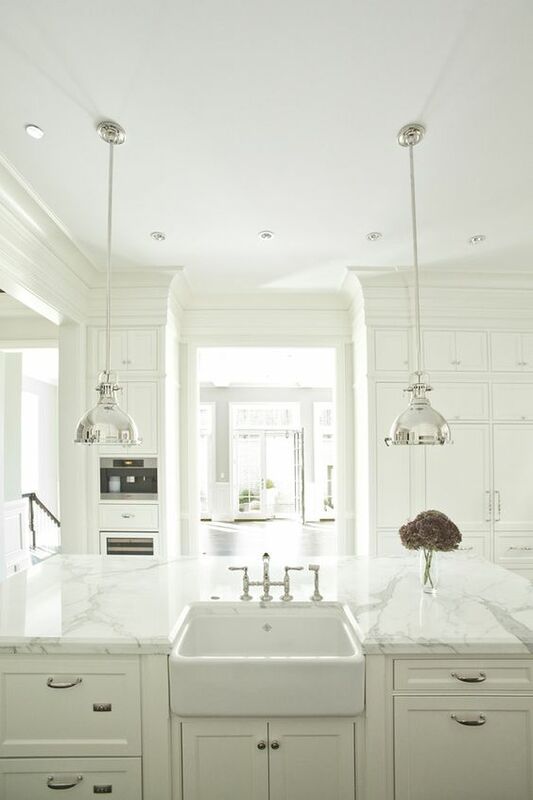 Instead of looking washed out, this subdued shade adds depth to another otherwise all-white kitchen. 5. Benjamin Moore Wrought Iron (and White Cloud). On its own, one might think that Benjamin Moore’s Wrought Iron paint colour is a little harsh for a kitchen cabinet, but in this space, and just on one set of cabinets (in this case the lower cabinets) works very well. 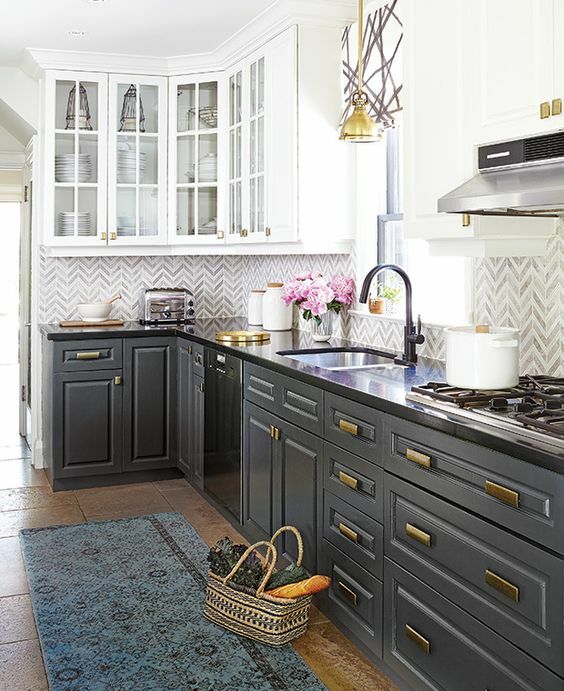 The cabinet colour is softened slightly with the addition of brass hardware, and the trendy chevron backsplash pulls the eyes up to the upper cabinets, which are painted in Benjamin Moore’s White Cloud. 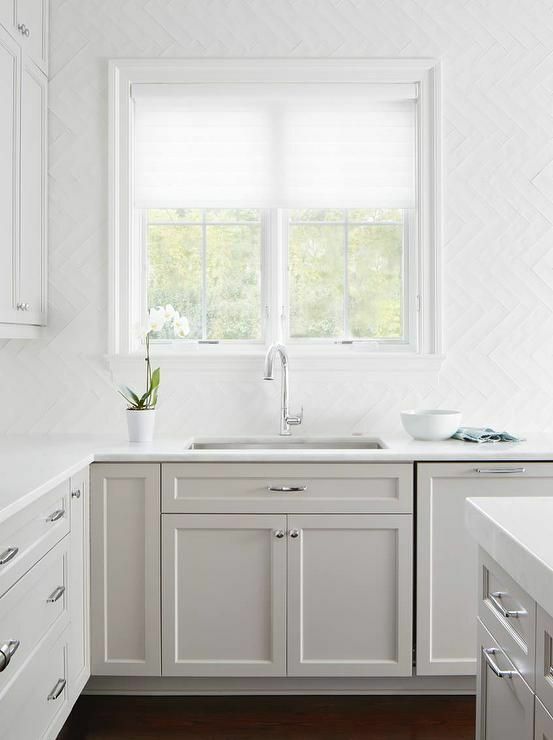 While white is certainly more my style, I love the idea of adding an accent colour on one set of kitchen cabinets — whether upper or lower, an island or pantry, or a coffee nook/wet bar. If you’re looking for kitchen cabinet colour inspiration, be sure to check out my Kitchen board on my Pinterest! I love flowers. In my opinion, no home is complete without an arrangement of fresh flowers. There’s just something about a fresh floral arrangement that can brighten and bring life to almost any space. 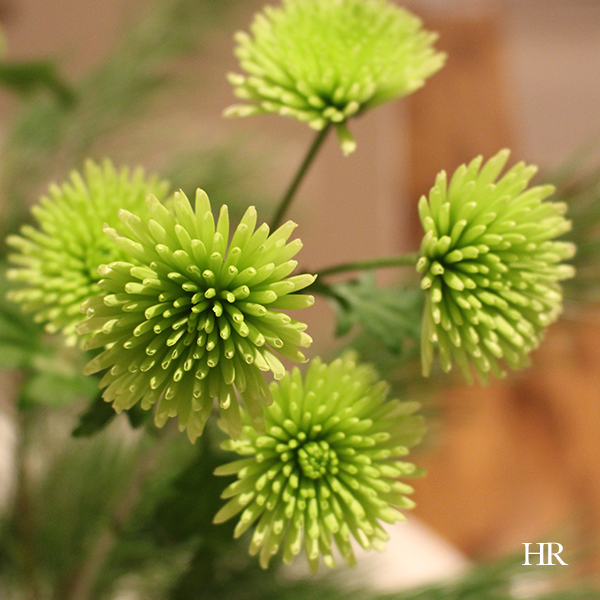 With preparations for Christmas well underway, decorating with flowers is one of the easiest ways to add a little festive cheer to your living space. Today I’ve put together some suggestions of great flowers to decorate with at Christmas time. Whether your style is classic or modern, these plants will bring Christmas cheer! 1. Red roses. 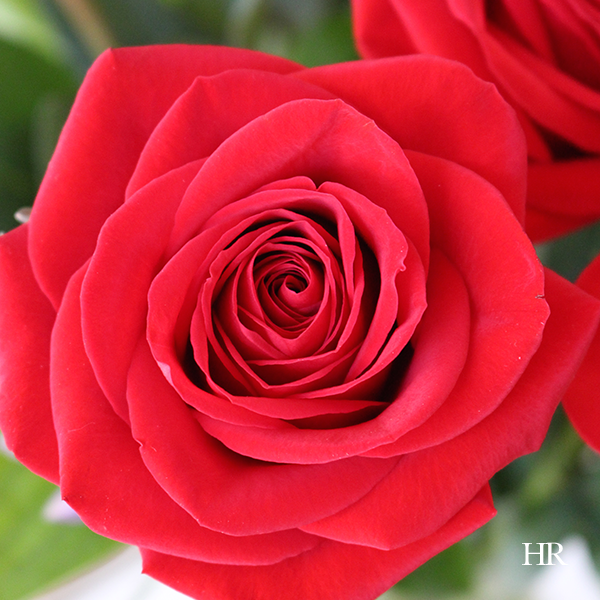 A traditional flower, roses are effortlessly elegant. On their own or as part of an extravagant arrangement, red roses make for a beautiful flower arrangement, not just at Christmas, but anytime of the year. 2. Evergreen branches. OK so they’re not flowers, but whatever your evergreen of choice, whether pine or spruce sprigs, evergreen branches make a festive addition to any Christmas flower arrangement. 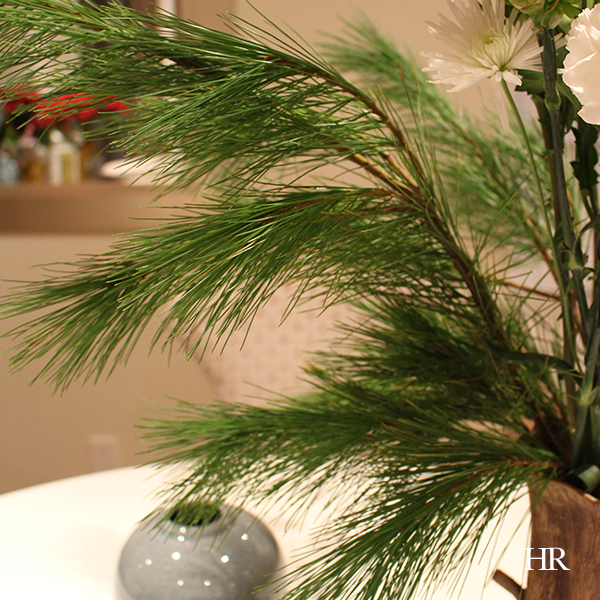 A sure sign of the season, pine branches or spruce branches add an additional layer of texture and and earthiness to floral arrangements. (Just be sure to keep them watered). 3. Green spray chrysanthemums. A favourite of mine anytime of year, there’s something so happy about these little blooms. Green spray chrysanthemums come in a variety of sizes depending where they’re at in their life cycle, and their vivid lime green colouring certainly will certainly as a contrast against deeper reds and greens in a Christmas flower arrangement. 4. White flowers. From carnations and chrysanthemums to roses and ranunculus, white flowers are a must when it comes to creating a Christmas flower arrangement. Maybe it’s because they remind me of snow, but there’s just something a pure, white flower that seems seasonally appropriate. Those are some of my favourite flowers for creating a Christmas flower arrangement; what flowers are you decorating with this Christmas season? 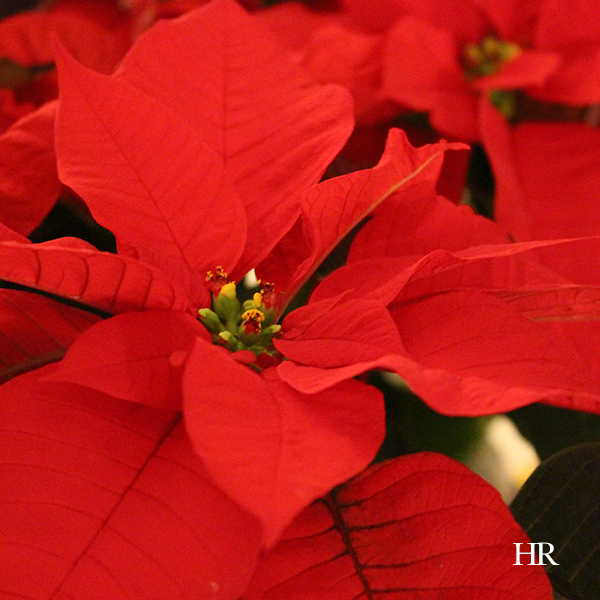 If you live in North America, poinsettias are one of the sure signs of Christmas! If you’ve ever wondered why poinsettia plants are closely associated with Christmas, it all comes back to a Mexican folk tale. Legend has it that a poor girl who couldn’t afford a gift to offer to Christ on Christmas Eve, instead brought an offering of weeds. When brought in to the church, because it was given in love, the weeds bloomed into red and green flowers. Poinsettias aren’t native to the U.S. or Canada, in fact, the poinsettia plant is native to southern Mexico and Central America. With blooms in red, burgundy, pink, peach, yellow, and cream, poinsettias (in their native land) can reach heights of up to sixteen feet tall! 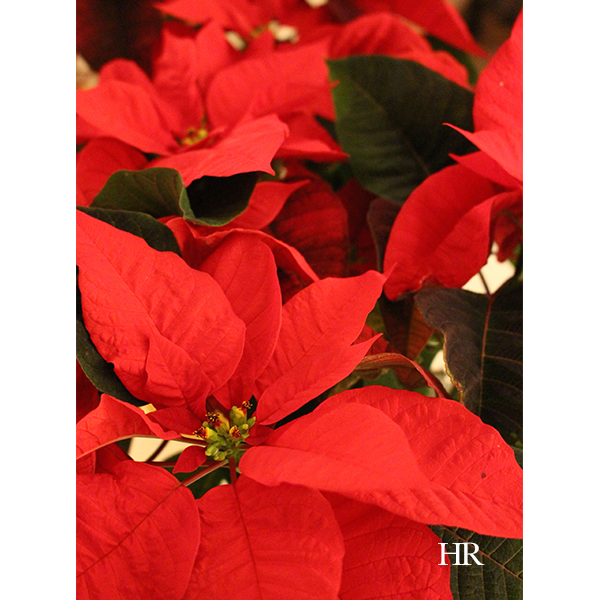 The poinsettia plant is named after the former U.S. Ambassador to Mexico, Dr. Joel R. Poinsett; it was Poinsett who introduced poinsettias to the U.S.
Poinsettias love sunlight, so try to position your poinsettia plant close to a sunny window; these plants love natural sunlight (hey, they’re native to Mexico and South America, so it only makes sense). Most poinsettias like at least five hours of sunlight each day. Poinsettias love water. Water your poinsettia plants regularly and don’t let the pot dry out. This is a balancing act because while poinsettia plants love water, they don’t fare well if their pot is over-watered. Be sure whatever container you’re keeping the plant in is able to drain any excess water. Poinsettias love maintenance. Be sure to keep the plant and the pot free from any excess leaves that may fall. If you find your poinsettia plant is losing a lot of leaves, that’s a sign the plant needs water, or is perhaps in a place with too much light. This may seem like a contradiction to the point above, but poinsettias can be picky. 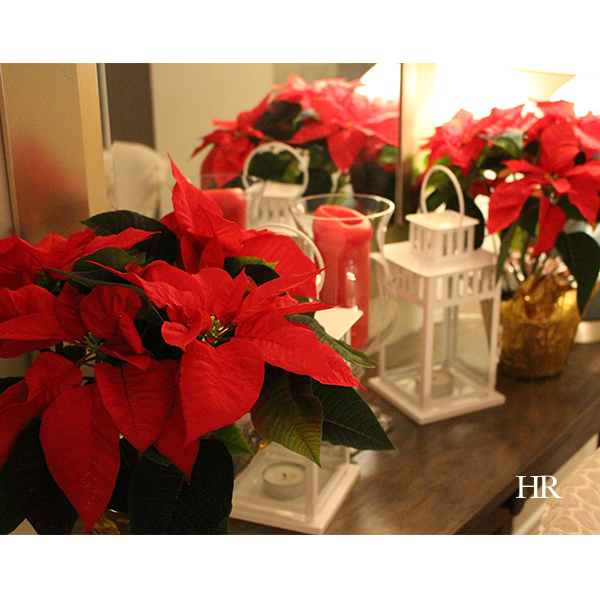 Interesting fact: Did you know that December 12th is National Poinsettia Day? The day is recognized in honour of the passing of Dr. Joel R. Poinsett (after whom the poinsettia plant is named). Looking for some indoor Christmas decorating ideas this season? You don’t have to break the bank to create an interior space that’s warm and inviting this holiday season. I’ve shared several lovely Christmas vignette scenes on my Pinterest, and today I’m sharing some of my favourites here on the blog. No matter your tastes, there are many indoor Christmas decorating ideas out there to get you inspired! 1. Tree slices and Christmas Centerpieces. 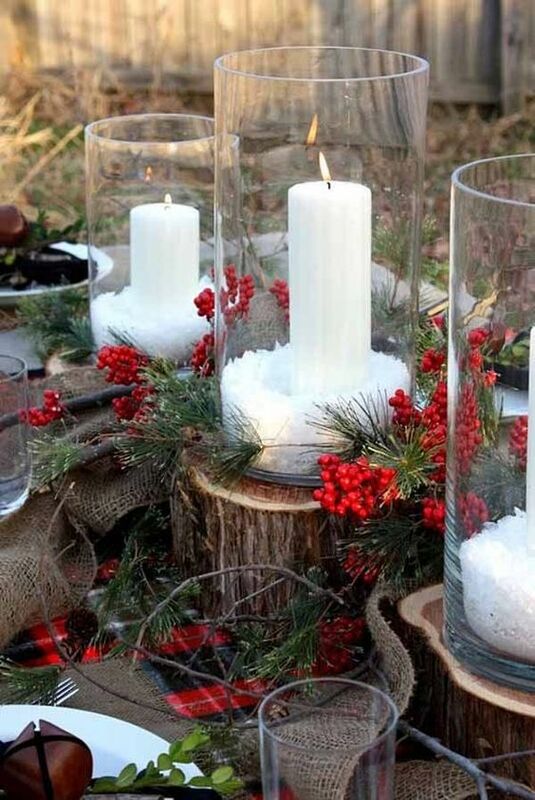 Very rustic, and very warm, I love the infusion of nature into this Christmas centrepiece. Tree slices — used as coasters, chargers, or even candle holders — are incredibly trendy right now. I love how the designer used tree slices of three different widths to create an interesting and eye-catching centrepiece. 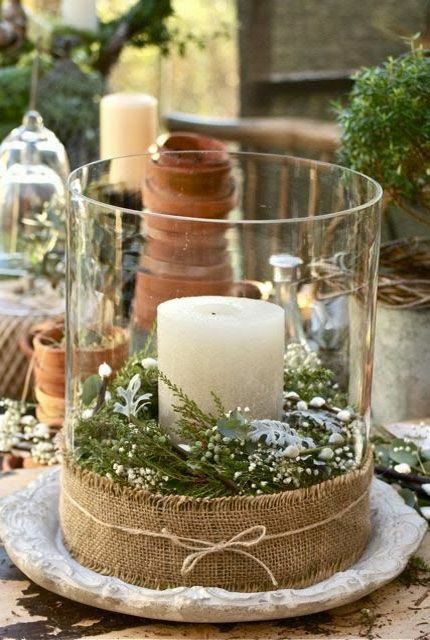 Balanced with burlap and plaid, as well as some sprigs of holly and evergreen, this is a beautiful table setting. 2. Mastering the mantelpiece with magnolias. 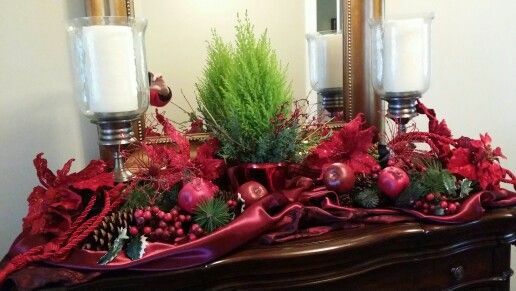 If you’ve got a fireplace mantle, put it to good use this Christmas season with some seasonal decorations. I love this earthy design, featuring neutral colours, pine cones, magnolia flowers, ever green sprigs, and great glass urns. The colours are classic. 3. Gorgeous Christmas garland. If you’ve got an open staircase, why not dress it for Christmas with some festive decor? I love the idea of a lighted Christmas garlic, complemented with lots of red ribbon (love how the designer incorporated it on the chandelier as well). Seem like a lot of work? Many garlands come pre-lit and pre-wrapped with ribbon. 4. Scandinavian-inspired centrepiece. Using straight lines and very little colour, this Scandinavian styled centrepiece features an over-sized glass holder, white candle, tasteful evergreen sprigs and earthy complements. And as with many trendy decor ideas, a little burlap wrapped around the bottom goes a long way. 5. Classic Christmas foyer mantel. 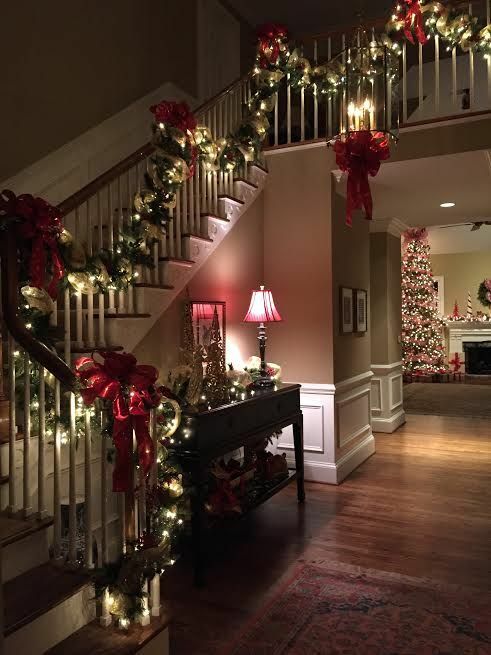 I love classic and traditional Christmas decor, and this foyer example is no exception. While a dwarf gold crest cypress isn’t necessarily traditional Christmas decoration, it works really well in this space, acting as a contrast to the more royal jewel tones. 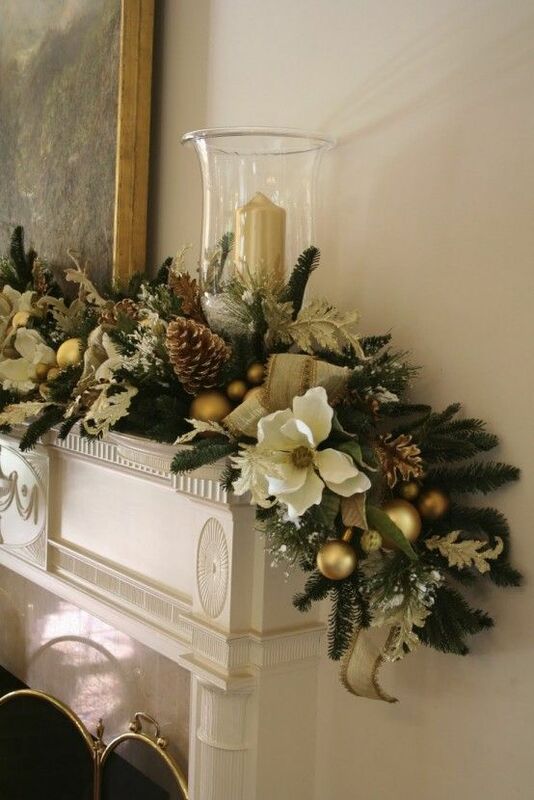 Balanced on either end by two large candles, this is a beautiful traditional Christmas mantel. If you’re looking for more indoor Christmas decorating ideas for your home, be sure to check out my For the Home board on Pinterest. Follow along for lots of seasonal interior design inspiration!